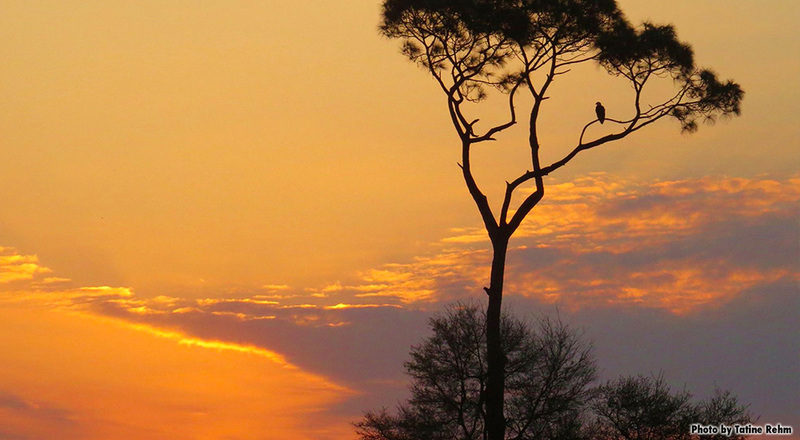 ‘Romeo’ and ‘Juliet’ are a pair of wild Eagles living in Northeast Florida. Since 2008 they have returned to the same nest, located 80′ above the ground in a Long-leaf pine tree. Each new year, they complete a new cycle of nestorations, egg laying, and raising their offspring. 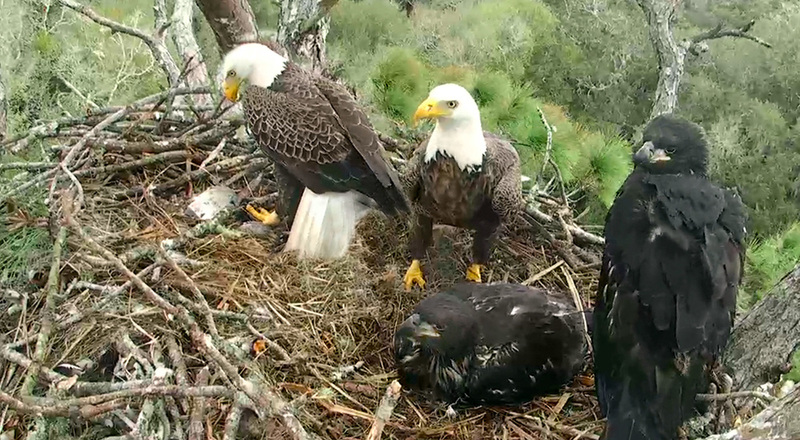 The nest is sizable, likely weighing close to a ton. Romeo and Juliet are dedicated parents. 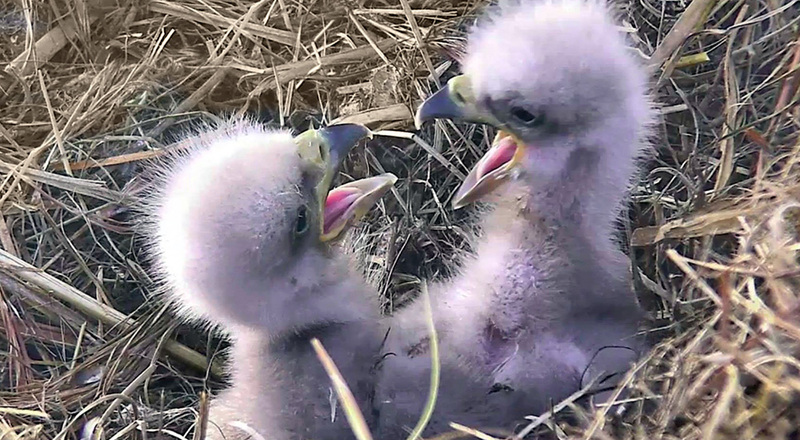 They typically lay and hatch two eggs annually and help their Eaglets successfully fledge. Food is always plentiful. Since 2008, Gretchen Butler, volunteer for the Audubon ‘EagleWatch’ Program and the American Eagle Foundation’s ‘Eagle Nest Cam’ Program, has closely monitored and documented important events associated with these eagles and their offspring. 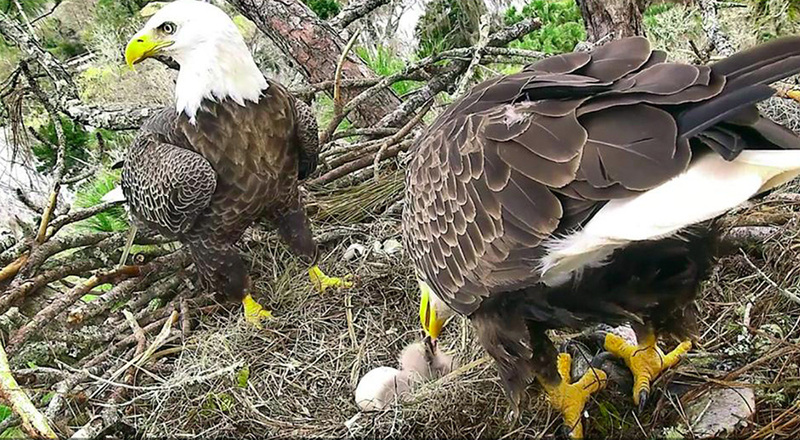 Her goal was to initiate the process for installing this Eagle cam, which would allow an up-close-and-personal glimpse of these majestic Bald Eagles to a worldwide audience, educating individuals of all ages about the USA’s precious National Symbol. With the support of the American Eagle Foundation, that mission was accomplished. 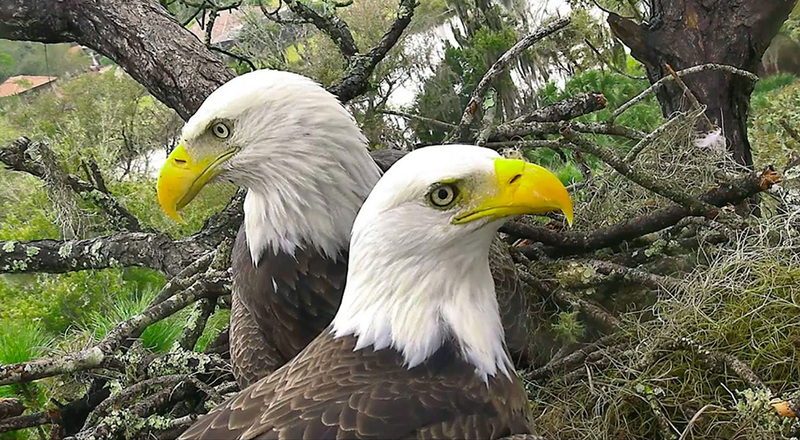 In August 2013, prior to the return of the eagles, two high-definition PTZ video Cam were installed, providing a view into the nest and a view up into the nest tree from below. The following year, a second, solar-powered PTZ HD cam was installed in the nest tree at a different angle, providing a total of three views. 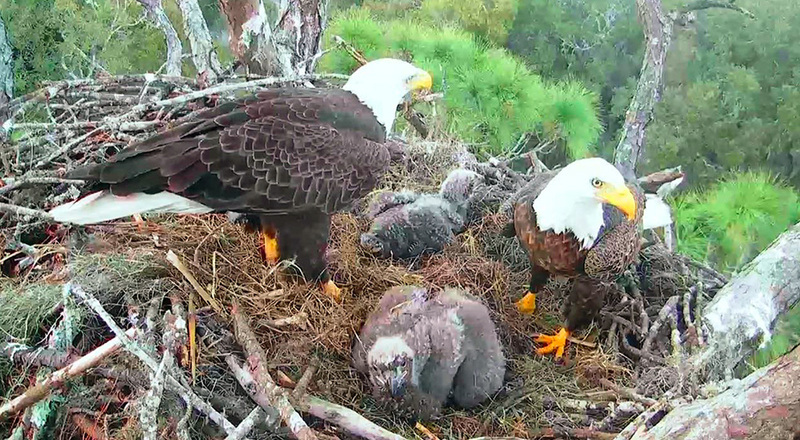 Viewers can experience all the excitement—Eggcitement—and nest activities without disturbing the day-to-day life of these nesting eagles. The AEF also provides a moderated Chat Forum to enhance the experience and to welcome and educate viewers. Dedicated Chat Moderators and Remote Camera Operators have the AEF’s undying gratitude for their professionalism, attention to detail, and welcoming presence they bring to all viewers! In late August or early September, the eagle pair usually return to this nest to begin their nesting cycle, which includes bonding, mating, nestorations, egg-laying, incubation, hatching, and raising their brood until their youngsters fledge and are able to fend for themselves. Mom (Juliet) and Dad (Romeo) typically remain in the nest area for 30-45 days after their young have fledged/migrated, enjoying some well-deserved time alone together in their special Florida habitat. Then, Romeo will head north for cooler, less humid climates first, and Juliet will leave several days later. The following breeding season, they return like clockwork and start their nesting, mating, and family-raising process all over again. It’s a major task to install the equipment necessary to video-stream a wild nest. Many people were involved, including donors, tree climbers, arborists, video camera technicians, electricians, wildlife conservation experts, property owners, cable TV technicians, webmasters, and nest-watch volunteers.